The roofing system of your Minneapolis or St. Paul home plays a major role in protecting you, your family, and your valuables. If your roofing system begins to function at a less than peak capacity, it is vital that you immediately call a professional roofer like Krech Exteriors. 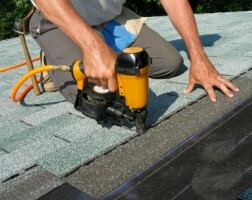 We are the expert roofer Minneapolis counts of for roof replacement and repair. Depending on the type of material your roof is made from, the amount of time it will function properly for varies. No matter what type of material used, however, every roof shows signs of age and wear and tear. These signs are not always immediately visible. Small leaks and cracks often hide under shingles or beneath your soffit. These are dangerous and must be addressed right away by an expert in roof repair. The roofing contractor Minneapolis and St. Paul trust first is Krech Exteriors. These signs are just a few of the indicators that your roof is not performing as it should. Krech Exteriors has more than two decades of experience in the recognition and repair of these problems. We work hard to promptly to correct them, so you home will be comfortable and dependable for years to come. So if you notice any of the above signs or suspect other problem areas on your roof, call Krech Exteriors today. We’ve got you covered!